Another Beautiful Day in Paradise. The air was a little humid and we had a ESE Breeze with pretty clear skies. Absentees Demitri, Crystal, Julie K, Karen T, Cindy S, Dave A and Wendy H came. Welcome all. We did our normal Clearwater Beach route. When we got to the Beach they had a big volleyball tournament going on. 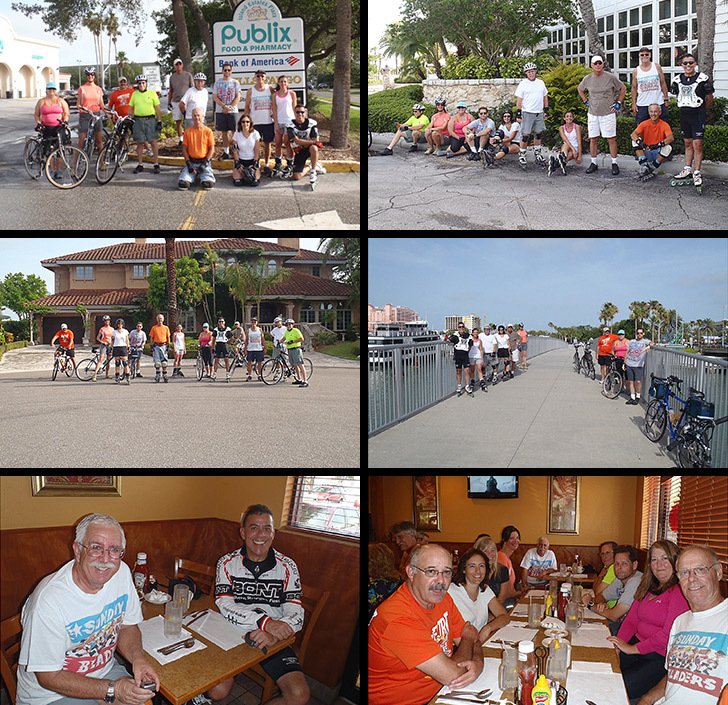 The group that did the Clearwater bridge did 11.8 miles and the rest did 11.2 miles. We had 6 Bladers and 7 Bicyclers. Julie K became a Sponsor today. Thanks Julie for the web site support. We Brunched at Georgie Boys Restaurant as planned. Julie called ahead for reservations and we got right in and seated at 2 tables. Georgie Boys sort of forgot we were there and it took 55 minutes to get served and about 1 hr and 20 minutes overall. Ratings of the Brunch ranged from 7 to 9.5. We'll give Georgie Boys an 8.